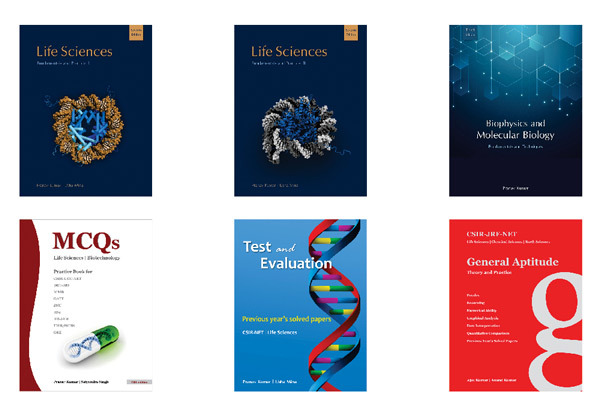 It includes six books for the preparation of CSIR-JRF-NET (Life Sciences) and other examinations like ICMR, GATE, DBT-JRF, IISc, JNU entrance examinations. Life Science, Fundamentals and Practice (Part I and part II) : Life Science, Fundamentals and Practice is available in two parts covering everything that one need to know to qualify CSIR-JRF-NET or related examination like ICMR, GATE, DBT-JRF without overwhelming themselves with unnecessary information. It covers essential fundamentals and techniques that will improve one's comprehension and help them perform better in the examinations. Test and Evaluation for Life Sciences: This book is designed for students to help them revise, consolidate and polish their knowledge and skills. It contains CSIR-NET previous year’s solved papers that may test the candidate’s knowledge of scientific concepts and application of scientific understandings. CSIR-JRF-NET General Aptitude Theory and Practice: This book has been developed to augment the preparation of part A of the CSIR-NET examination in various subjects such as life sciences, physical sciences, chemical sciences etc.